Penetrating wood oil that seals and protects both hard and soft woods like teak and mahogany. Preserves wood's natural beauty and protects it from the elements. For interior and exterior use. Easy to apply on clean, dry wood. Easy to maintain. Exterior teak wood has a hard life at sea. The elements quickly age it to a silver-gray, weathered look. 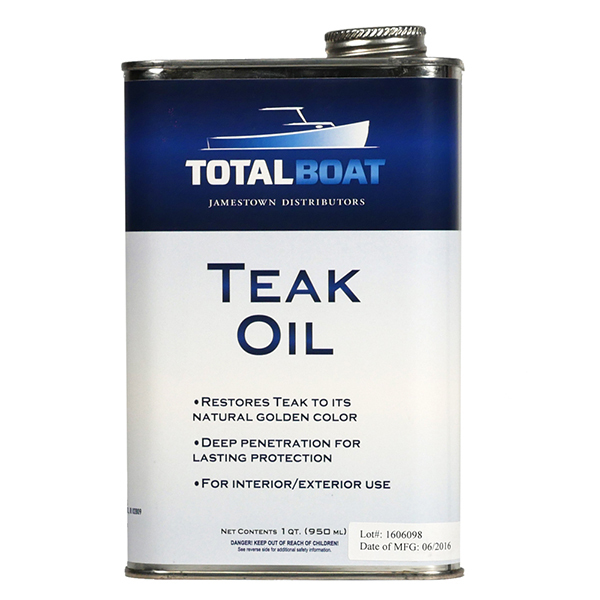 Apply TotalBoat Teak Oil on clean teak to preserve that golden “boat show” glow. It’s perfect for teak decking, flag poles, handrails, molding, mounting brackets, storage racks, swim platforms and other trim. Other teak oils are notorious for turning wood orange or black. Ours won’t. All TotalBoat products are for boaters, by boaters. We know what works and what doesn’t.